On the hunt for a criminal, Everett will find the love he walked away from. Amanda, Cooper and Everett were the best of friends, and after an intimate encounter at Cadence Falls, Amanda believed they’d be together forever. But when Everett leaves without a word, her heart breaks and she pulls away from Cooper too. Years later, a dangerous felon has escaped from prison. When he disappears into the vast Montana mountains, the US Marshalls come to town and they bring along a Shadow Wolf tracker—Everett. For Everett, it’s the one place he really doesn’t wish to return to, since he knows the long-lost love of his life, Amanda, still lives there with his once best friend, Cooper. For Cooper, Everett’s appearance brings up remembered love and pain, creating more discord between the three of them. When they’re forced to work together to help capture the criminal, will they be able to get over past hurts and reconcile, or will they forget about their time at Cadence Falls forever? Publisher's Note: This book has previously been released as part of the Boots, Chaps and Cowboy Hats anthology with Totally Bound Publishing. This is a short story with a good plot and a hot and steamy outcome. An unplanned return to his home town brings back a lot of memories for Everett. Little did he expect to find the two people he still loves, living apart. In few words and pages, Ms. Carter (who is a very good writer of trios) gives us three leads that should be back together – enabling a short story to be satisfying and believable. 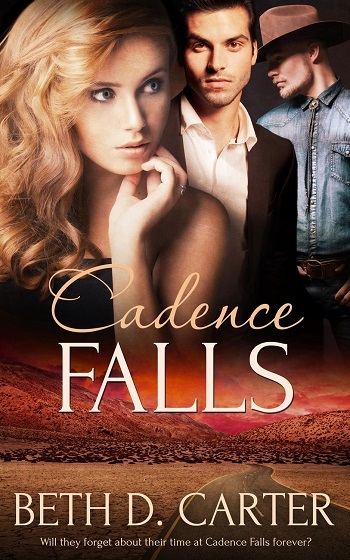 Reviewers on the Wicked Reads Review Team were provided a free copy of Cadence Falls by Beth D. Carter to read and review.